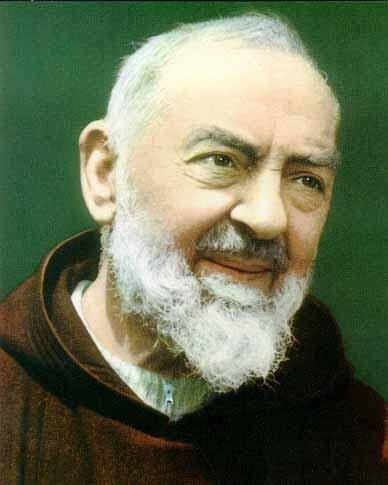 Padre Pio was born Francesco Forgione, on 25 May 1887, in Pietrelcina, a farming town in the southern Italian region of Campania. He died in San Giovanni Rotondo 23 September 1968. To read more about Padre Pio click on this link which will bring you to wikipedia. Your Mother's heart, because it will always follow you. O God, you gave Saint Pio of Pietrelcina, Capuchin priest, the great privilege of participating in a unique way in the passion of Your Son. Grant me through his intercession the grace of ......... which i ardently desire; and above all grant me the grace of living in conformity with the death of Jesus, to arrive at the glory of the resurrection. Glory be to the Father (three times). invited to recite it daily so as to be spiritually united with the Prayer of Saint Pio. O Sacred Heart of Jesus, for whom it is impossible not to have compassion on the affliced, have pity on us miserable sinners and grant us the grace which we ask of you, through the Sorrowful and Immaculate Heart of Mary, your tender mother and ours. Say the Hail Holy Queen, and add St Joseph, foster father of Jesus, pray for us.